Poems in this collection have appeared in 5 A.M., Black Bear Review, Blue Mesa Review, Borderlands, Cape Rock, Chiron Review, Connecticut River Review, Convolvulus, Crucible, Exquisite Corpse, Flyway, The MacGuffin, Many Mountains Moving, Marlboro Review, Nerve Cowboy, Painted Hills Review, Piedmont Literary Review, Poet Lore, Sou'wester, Willow Review, Writers' Forum, Zone 3 and many other fine journals. 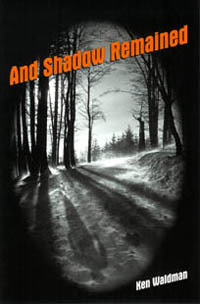 "The poems in And Shadow Remained are Ken Waldman's best--they're dark, sad, and knowing, fragmented snapshots of family regret, busted relationships, and a man moving through the harsh Alaskan terrain as he tries to stay warm with a song. Insights aren't sufficient, good intentions never good enough, as we learn in the emblematic explosions of "Depression Glass" or the desecrated bible in the harrowing "My Father's Gift." There's humor, too, though, to distract from hunger (who can resist a poem titled "When Meat Was Meat" of Satan Found!"? ), and, finally, enough food here to feed a lost army. The poet offers recipe after recipe that he assures us will comfort and sustain." "From an unhappy barmaid escaping her Juneau job mid-shift "she'll duck out at 10/leaving the bar shorthanded" to his family of origin in suburban Philadelphia, Waldman's moving third collection charts the shadows and light of human experience, celebrating 'the heart/that red cask/of hunger, light.'" of whiskey-bread pudding he'd ever seen.